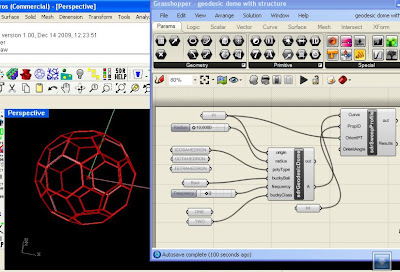 This example file demonstrates calling on the BullAnt Geodesic dome function from within Grasshopper, as well as sweeping structural profiles including member orientation. Try for yourself, but you'll need a valid license (or free trial license) file to do so. Hi Jon, what is profile property table? I opened the rhino model, but could not find any structure in it. what are the definitions for frequency and bucky class in the sdrGD? The profile property table was used before I developed components for structure profiles in Grasshopper. I've added a newer version of the file to the post. http://www.geo-dome.co.uk/article.asp?uname=domefreq has a good explanation of variation of geodesic domes. I'm trying to create a geodesic dome with rectangular struts. I've followed the example above but both main commands shown (ss's) are now different and don't produce the same outputs. is there a more updated version? I just checked the newer file now and it worked. Make sure you install Bullant http://www.geometrygym.com/downloads and have a rhino document with metres open. Let me know if it doesn't work. Hi Jon thanks for the quick reply. I've actually managed to create the sphere. The problem I'm facing now is that i can't offsetSrf it in order to give the shape thickness. The command failes on some faces. Do you maybe have a solution for that?